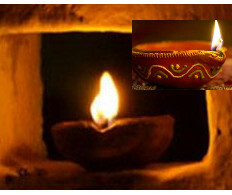 Diwali or Deepavali is one of the famous Hindu festival in India. Diwali is celebrated on a new moon night in the Malayalam month Thulam (October / November month). Deepavali is also known as Festival of Lights. According to legend, Deepavali is celebrated to commemorate the return of Lord Rama from 14 years of exile after defeated Ravana. Goddess Lakshmi, the god of wealth and prosperity is worshiped during this Deepavali festival. This day spiritually signifies the victory of light over dark, good over evil, knowledge over ignorance, and hope over despair. Diwali is a 5 day festival. The first day of Diwali is called Dhanteras / Dhanvantari Triodasi. On this day Lord Dhanwantari came out of the ocean with Ayurvedic for mankind. This day celebrates the birthday of Dhanvantari – the God of Health and Healing and the birthday of Lakshmi. The 2nd day of diwali is called Narak Chaturdasi. On this day Lord Krishna killed the demon Narakasur and made the world free from fear. Main festive day is the 3rd day callled Lakshmi Puja. This day pujas are offered to God Lakshmi. On this day, people decorate their homes with oil lamps, lights and celebrate by sparklers and variety of small fireworks. The fourth day, day after Diwali, is celebrated as Padwa dedicated to wife husband relationship. Fifth day of the Diwali is called Bhai teeka. The day emphasizes the lifelong loving relationship between brothers and sisters.